"Mercury Use in Lighting" summarizes the use of mercury in lighting devices, such as fluorescent lamps, automobile headlights, and neon signs. This Fact Sheet covers all the types of lamps that contain mercury in the individual devices; the total amount of mercury in all of the devices that were sold as new in the U.S. in 2001 and 2004; mercury lamp recycling/disposal; and non-mercury alternatives. The information may not represent the entire universe of mercury-containing lamps sold in the U.S. The IMERC-member states continuously receive new information from mercury-added product manufacturers, and the data presented in this Fact Sheet may underestimate the total amount of mercury sold in this product category. The information summarizes mercury use in lighting sold nationwide since 2001. It does not include mercury-added lamps sold prior to January 1, 2001 or exported outside of the U.S.
Mercury is used in a variety of light bulbs. Mercury is useful in lighting because it contributes to the bulbs' efficient operation and life expectancy. Fluorescent and other mercury-added bulbs are generally more energy efficient and last longer than incandescent and other equivalent forms of lighting. While the bulbs are being used, the mercury within them poses no health risk. Fluorescent lamps3 operate at a very low gas pressure. They produce light when an electric current passes between two electrodes (also called cathodes) in a tube filled with low-pressure mercury vapor and inert gases, such as argon and krypton. 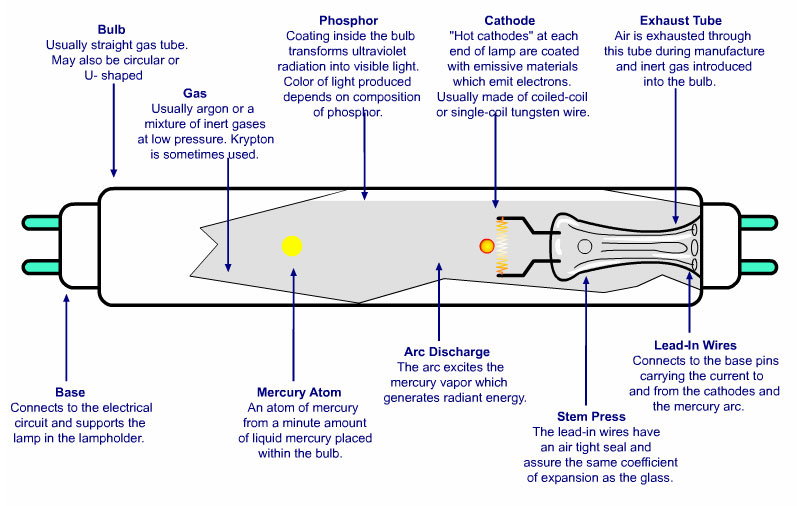 The electric current excites the mercury vapor in the tube, generating radiant energy, primarily in the ultraviolet (UV) range. The energy causes a phosphor coating on the inside of the tube to "fluoresce," converting the UV light into visible light. Changing the composition of the phosphor powder inside fluorescent tubes changes the spectrum of light produced. Mercury is present in the lamp in both the phosphor powder and in the vapor. Photo Source: Northeast Lamp Recycling, Inc.
Fluorescent lamps require a ballast, which is a device used to provide and control the voltage in the lamp, and stabilize the current in the circuit. Fluorescent lamps are more energy efficient than incandescent light bulbs of an equivalent brightness because more of the energy input is converted to usable light and less is converted to heat. They also have a longer lamp life. Depending on the type of fluorescent lamp, they can contain a wide range of mercury, from greater than 0 up to 100 milligrams (mg). According to the National Electrical Manufacturers Association (NEMA), about half of the fluorescent lamps manufactured by their members and sold in the U.S. contain 5 to 10 mg of mercury; while a quarter contain 10 to 50 mg. Linear fluorescent, U-tube, and Circline lamps are used for general illumination purposes. They are widely used in commercial buildings, schools, industrial facilities, and hospitals. Bug zappers contain a fluorescent lamp that emits ultraviolet light, attracting unwanted insects. Tanning lamps use a phosphor composition that emits primarily UV-light, type A (non-visible light that can cause damage to the skin), with a small amount of UV-light, type B. Black lights use a phosphor composition that converts the short-wave UV within the tube to long-wave UV rather than to visible light. They are often used in forensic investigations. 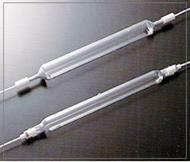 Germicidal lamps do not use phosphor powder and their tubes are made of fused quartz that is transparent to short-wave UV light. The ultraviolet light emitted kills germs and ionizes oxygen to ozone. These lamps are often used for sterilization of air or water. High output fluorescent lamps (HO) are used in warehouses, industrial facilities, and storage areas where bright lighting is necessary. High output lamps are also used for outdoor lighting because of their lower starting temperature, and as grow lamps. They operate the same as fluorescent lamps, but the bulbs are designed for much higher current arcs. The light emitted is much brighter than that of traditional fluorescent lamps. However, they are less energy-efficient because they require a higher electrical current. Cold-cathode lamps are small diameter, fluorescent tubes that are used for backlighting in liquid crystal displays (LCDs) on a wide range of electronic equipment, including computers, flat screen TVs, cameras, camcorders, cash registers, digital projectors, copiers, and fax machines. They are also used for backlighting instrument panels and entertainment systems in automobiles. Cold-cathode fluorescent lamps operate at a much higher voltage than conventional fluorescent lamps, which eliminates the need for heating the electrodes and increases the efficiency of the lamp 10 to 30 percent. They can be made of different colors, have high brightness, and long life. Compact fluorescent lamps (CFL) use the same basic technology as linear fluorescent lamps, but are folded or spiraled in order to approximate the physical volume of an incandescent bulb. Screw-based CFLs typically use "premium" phosphors for good color, come with an integral ballast, and can be installed in nearly any table lamp or lighting fixture that accepts an incandescent bulb. Pin-based CFLs do not employ integral ballasts and are designed to be used in fixtures that have a separate ballast. Both screw-based and pin-based CFLs are used in commercial buildings. Residential use of these types of bulbs is growing because of their energy efficiency and long life. Individual CFLs generally contain less than 10 mg of mercury, with a significant portion (two-thirds) containing less than 5 mg. A small percentage of CFLs contains between 10 and 50 mg of mercury. High intensity discharge (HID)4 is the term commonly used for several types of lamps, including metal halide, high pressure sodium, and mercury vapor lamps. HID lamps operate similarly to fluorescent lamps. An arc is established between two electrodes in a gas-filled tube, causing a metallic vapor to produce radiant energy. HID lamps do not require phosphor powder, however, because a combination of factors shifts most of the energy produced to the visible range. In addition, the electrodes are much closer together than in most fluorescent lamps; and under operating conditions the total gas pressure in the lamp is relatively high. This generates extremely high temperatures in the tube, causing the metallic elements and other chemicals in the lamp to vaporize and generate visible radiant energy. HID lamps have very long life. Some emit far more lumens per fixture than typical fluorescent lights. Like fluorescent lamps, HID sources operate from ballasts specifically designed for the lamps type and wattage being used. In addition, HID lamps require a warm-up period to achieve full light output. Even a momentary loss of power can cause the system to "re-strike" and have to warm up again - a process that can take several minutes. Metal halide lamps (MH) use metal halides such as sodium iodide in the arc tubes, which produce light in most regions of the spectrum. They provide high efficacy, excellent color rendition, long service life, and good lumen maintenance, and are commonly used in stadiums, warehouses, and any industrial setting where distinguishing colors is important. They are also used for the bright blue-tinted car headlights and for aquarium lighting. Low-wattage MH lamps are available and have become popular in department stores, grocery stores, and many other applications where light quality is important. Of all the mercury lamps, MH lamps should be considered a complete system of lamp, ballast, igniter, fixture, and controls. The amount of mercury used in individual MH lamps ranges from more than 10 mg to 1,000 mg, depending on the power level. According to NEMA, about one-third of these lamps sold in the U.S. contain greater than 100 to 1,000 mg of mercury. Ceramic metal halide lamps (CMH) were recently introduced to provide a high quality, energy efficient, alternative to incandescent and halogen light sources. Many are designed to be optically equivalent to the halogen sources they were designed to replace. They are used for accent lighting, retail lighting, and are useful in high volume spaces, with ceiling heights of 14-30 feet. The arc tube is made of ceramic. CMH lamps provide better light quality, better lumen maintenance, and better color consistency than MH lamps at a lower cost. CMH lamps contain less mercury than MH lamps. The majority contain from greater than 5 mg to 50 mg of mercury. High pressure sodium lamps (HPS) are a highly efficient light source, but tend to look yellow and provide poor color rendition. HPS lamps were developed in 1968 as energy-efficient sources for exterior, security, and industrial lighting applications and are particularly prevalent in street lighting. Standard HPS lamps produce a golden (yellow/orange) white light when they reach full brightness. Because of their poor color-rendering their use is limited to outdoor and industrial applications where high efficacy and long life are priorities. HPS lamps generally contain 10 to 50 mg of mercury. A small percentage contains more than 50 mg of mercury. Mercury vapor lighting is the oldest HID technology. The mercury arc produces a bluish light that renders colors poorly. Therefore, most mercury vapor lamps have a phosphor coating that alters the color and improves color rendering to some extent. 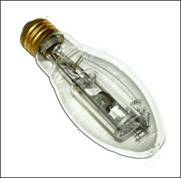 Mercury vapor lamps have a lower light output and are the least efficient members of the HID family. They were developed to overcome problems with fluorescent lamps for outdoor use but are less energy efficient than fluorescents. Mercury vapor lamps are primarily used in industrial applications and outdoor lighting (e.g., security equipment, roadways, and sports arenas) because of their low cost and long life (16,000 to 24,000 hours). NEMA notes that these lamps represent a diminishing market, and their use will continue to decline because their ballasts have been banned under the Energy Policy Act of 2005 (EPACT). According to NEMA, mercury vapor lamps generally contain between 10 and 100 mg of mercury. A small portion contains greater than 100 mg of mercury. Mercury short-arc lamps are spherical or slightly oblong quartz bulbs with two electrodes penetrating far into the bulb so that they are only a few millimeters apart. The bulb is filled with argon and mercury vapor at low pressure. Wattage can range from under a hundred watts to a few kilowatts. With the small arc size and high power, the arc is extremely intense. Mercury short-arc lamps are used for special applications, such as search lights, specialized medical equipment, photochemistry, UV curing, and spectroscopy. The mercury short-arc lamps contain relatively larger amounts of mercury, typically between 100 mg and 1,000 mg. Nearly a quarter of these lamps contain more than 1,000 mg of mercury. Mercury xenon short-arc lamps operate similarly to mercury short-arc lamps, except that they contain a mixture of xenon and mercury vapor. However, they do not require as long a warm up period as regular mercury short-arc lamps, and they have better color rendering. They are used mainly in industrial applications. The mercury xenon short-arc lamps can contain anywhere between 50 mg and 1,000 mg of mercury. A small percentage of these lamps contain more than 1,000 mg of mercury. Mercury capillary lamps provide an intense source of radiant energy from the ultraviolet through the near infrared range. These lamps require no warming-up period for starting or restarting and reach near full brightness within seconds. They come in a variety of arc length, radiant power, and mounting methods, and are used in industrial settings (i.e., for printed circuit boards), for UV curing, and for graphic arts. UV curing is widely used in silkscreening, CD/DVD printing and replication, medical manufacturing, bottle/cup decorating, and converting/coating applications. These specialized lamps contain 100 to 1,000 mg of mercury. Neon lights are gas discharge bulbs that commonly contain neon, krypton, and argon gasses (also called noble gasses) at low pressure. Like fluorescent bulbs, each end of a neon light contains metal electrodes. Electrical current passing through the electrodes ionizes the neon, and other gases, causing them to emit visible light. Neon emits red light; other gases emit other colors. For example, argon emits lavender and helium emits orange-white. The color of a "neon light" depends on the mixture of gases, the color of the glass, and other characteristics of the bulbs. Although the term "neon light" refers to all gas discharge bulbs using noble gases, regardless of the lamp color, only the red bulbs are true neon lights (i.e., use neon). Red neon lights do not contain mercury. Almost every other "neon light" color uses argon, mercury, and phosphor, in addition to other noble gases. The neon light industry is a cottage industry. Artisans make each lamp individually in small workshops. The vast number of neon light manufacturers has made it difficult for IMERC to identify them. As a result, the IMERC-member states have not yet received Notifications from most of the manufacturers of neon lights. Neon lights are estimated to contain approximately 250 to 600 mg of mercury per bulb, depending on the manufacturer's preference. Table 1 summarizes the range in the amount of mercury in each type of mercury lamp manufactured and sold as new in the U.S. Manufacturers, importers, and distributors of mercury-added products report the amount of mercury used as an exact number or as a range. This data was reported to the IMERC-member states by the National Electrical Manufacturers Association (NEMA) member companies for calendar year 2004. According to the lamp manufacturers, approximately 60 percent of all fluorescent lamp types sold in the U.S. in 2004 contained 10 mg of mercury or less. The remaining 40 percent contained more than 10 mg and up to 100 mg of mercury. Lamps used in tanning equipment were reported to contain an average of 17 mg of mercury per lamp, with a high of 20 mg and a low of 5.5 mg. Germicidal lamps were reported to contain an average of 7.6 mg mercury per lamp, with a high of 70 mg and a low of 5.5 mg. All four-foot linear fluorescent lamps reportedly contained an average of 13.3 mg, with a high of 70 mg and a low of 2.5 mg. The four-foot fluorescent lamps that passed the Toxicity Characteristic Leaching Potential (TCLP)5 test contained an average of 5.3 mg of mercury, with a high of 20 mg and a low of 1.4 mg. Compact fluorescents had the least amount of mercury per lamp in 2004. Two-thirds of these lamps contained 5 mg of mercury or less, while 96 percent contained 10 mg or less. HID lamps as a class contained relatively larger amounts of mercury in individual lamps sold in 2004. Of all the HID lamps, the MH lamps contained the largest amounts of mercury. Nearly three-quarters of the MH lamps sold in 2004 by NEMA-member companies contained from more than 50 mg up to 1,000 mg of mercury. Mercury short-arc and mercury capillary lamps contained relatively large amounts of mercury. Two-thirds of mercury short-arc lamps contained 100 mg to 1,000 mg of mercury, with an additional 23 percent containing more than 1,000 mg of mercury. Mercury capillary lamps all contained greater than 100 mg up to 1,000 mg of mercury. Table 2 presents the total amount of mercury in lamps sold in the U.S. during calendar years 2001 and 2004 for all of the lamp manufacturers reporting to IMERC, and for the companies represented by NEMA only. * The 2001 data does not break out HID lamps by specific types; a few manufacturers provided this information. ** This category includes some HID lamps. It was not possible to separate them from the other lamps in the category. In 2001, all the lamp manufacturers reporting to the IMERC-member states sold approximately 21,438 pounds or approximately 10.7 tons of mercury in mercury lamps. This declined by 0.6 tons in 2004, representing a 6 percent decrease. The use of mercury in fluorescent lamps declined by 14 percent, whereas the use of mercury in HID lamps increased by approximately 15 percent. The decrease of total mercury in fluorescent lamps is likely due to manufactures' efforts to reduce mercury dosing per bulb, while higher sales likely accounts for the increase in total mercury for HID lamps. The greatest change between the two reporting years is in total mercury used in compact fluorescent lamps, increasing nearly 70 percent, which is attributed to increased sales. Although mercury short-arc lamps contain more mercury in each unit than fluorescent lamps, the total for all units was low because few were sold in the U.S.
Of the total mercury in 2001 shown in Table 2, 72 percent was sold in lamps manufactured by NEMA-member companies. Mercury in lamps sold by NEMA-members increased slightly in 2004 to 79 percent of the total mercury sold in lamps. Since 2004, there has been a significant increase in the number of electronics utilizing cold-cathode fluorescent lamps, often in a series used for illumination in displays. Stand-alone LCD monitors are now standard with many new computers, and a wide variety of home and office equipment now utilize LCD screens, including televisions, global positioning system (GPS) units, hand-held communications and entertainment systems, and digital cameras. Use of mercury-added lamps in automobiles and recreational vehicles has also increased significantly over the last few years. In addition to HID headlamps, many automobiles now come with entertainment systems, navigation systems, and instrument panels that utilize LCD screens or backlighting that contain mercury lamps. Many recreational vehicles also offer option packages that include flat-panel televisions that contain fluorescent lamps and linear fluorescent lamp fixtures. In recent years, government agencies, companies, and environmental organizations have heavily promoted the use of energy-efficient liner and compact fluorescent bulbs. The cost of CFLs has declined dramatically so that they are more affordable for consumers. These efforts and the growing sale of products with LCD screens will likely increase total mercury use in lamps in the 2007 triennial reporting year. According to the EPA, fluorescent and other mercury lamps must be managed as hazardous waste under the Universal Waste Rule7 unless the bulb passes the TCLP. All of the IMERC-member states, California, Connecticut, Illinois, Louisiana, Maine, Massachusetts, Minnesota, New Hampshire, New Jersey, New York, North Carolina, Rhode Island, Vermont, and Washington have adopted the Universal Waste Rule. These states require businesses and other non-residential organizations to recycle mercury-containing lamps or dispose of them as either universal or hazardous waste. In most cases, residential households are exempt from these regulations. However, in some states, including Maine, Massachusetts, Minnesota, and Vermont, households must properly recycle or dispose of all mercury-containing lamps, including CFLs. There are a significant number of companies, government programs, and non-governmental organizations involved with collecting and recycling spent mercury-added lamps.8 The states of New Hampshire and Vermont have been successful working with local hardware stores to collect and recycle spent fluorescent lamps. Recently, Home Depot launched a national campaign to collect and recycle CFLs from consumers.9 The free program allows consumers to drop-off their spent fluorescent lamps for recycling at almost 2,000 store locations. Other independent hardware stores and hardware store chains, including Ace and TrueValue, may accept CFLs and/or other fluorescent lamps for collection and recycling at some store locations. Household hazardous waste (HHW) programs will also accept and recycle CFLs and other fluorescent lamps in many communities. Sylvania offers a convenient mail-back program for consumers to return their spent CFLs for recycling.10 Consumers can order a "Mini RecyclePak" for $15.00 online. The kit is pre-labeled and comes with all the necessary packing materials so consumers simply return the kit with the spent bulbs to any U.S. Post Office or mail collection center. Sylvania also offers recycling kits for businesses and distributors that fit other sizes of fluorescent lamps. For more information on state-specific lamp recycling and disposal requirements visit the following websites: http://www.newmoa.org/prevention/mercury/lamprecycle/requirements.cfm and/or http://www.almr.org/. Homeowners and businesses can also call their state environmental agencies' hazardous waste bureaus for more information. The Maine Department of Environmental Protection (Maine DEP) recently completed a study on mercury releases from CFL breakage.11 The Study suggested that mercury concentrations from a broken bulb may be above safe indoor air levels. As a result, Maine DEP revised its clean-up guidance for broken CFLs. The U.S. Environmental Protection Agency (EPA) and many state environmental agencies have reviewed the Maine Report and updated their broken CFL clean-up recommendations as well. The EPA is continuously updating this guidance for consumers and plans to conduct additional research on proper clean-up of broken CFLs. As stated above, mercury is contained in a powder form and as a vapor in fluorescent lamps, and it adheres to the glass walls of lamps over time. For more information on possible mercury releases from lamps to the environment visit: http://www.newmoa.org/prevention/mercury/landfillfactsheet.cfm. At this time technology is not available to make general purpose, energy efficient light bulbs without mercury, although non-mercury bulbs have been recently developed for specific purposes, such as car headlights or store display lighting. Mercury-added bulbs will therefore continue to be used, but should be managed as a hazardous waste, and recycled, at the end of their useful life. As stated above, each state has specific regulations for businesses and homeowners regarding recycling or disposal of mercury-added lamps. Light-emitting diode (LED) technology is one option that, with more research and development, is expected to be a viable alternative to mercury-containing lamps in the future.12 An LED is a semi-conductor diode that emits light when an electrical current is passed in the forward direction of the device through the LED circuit. The light emitted from LED lamps depend on the semi-conductor material used and may appear blue (cooler) or white (warmer) in color. LEDs have been around since the 1960s for commercial applications and offer energy efficiency, maintenance savings, impact resistance, durability, and other benefits. They are significantly more energy efficient than incandescent and fluorescent lamps. Today's LEDs are commonly used in commercial lighting applications, such as stadium displays, billboards, traffic lights, streetlights, and, more recently, as indicator lights in automobiles and aircraft carriers. For most general lighting purposes, however, LEDs cannot yet compete with fluorescent lamps because of their cost - especially when compared to the CFLs on the market today. More research is needed to increase the energy efficiency and decrease the cost of LED technologies.